Even though Uwe Boll's video game based movies are almost universally panned I sometimes can't help but feel bad for the guy. I mean, his newest movie - Postal - based off the PC game of the same name, was supposed to open this past weekend in over 1,000 theaters in North America. Instead, within the last month all but 21 theatres pulled the plug on the movie. Three of these theatres just happen to be in Canada. Laden etc.... but this all doesnt matter because you are all busy to THINK that INDIANA JONES or NARNIA are important movies ... but in real they are empty shells of an industry what wants to make money and what wants to keep you looking "escape movies" with nothing in it." 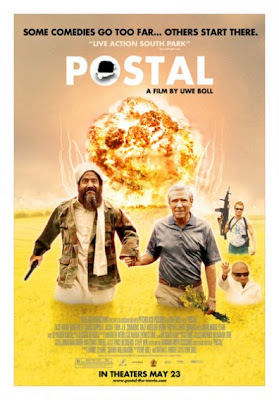 Sounds like Uwe Boll's gone a little postal himself if you ask me! For a complete listing of theatres & showtimes, check out the movie's Page on Facebook.